The May 18-19, 2017 snowstorm hit at the same time the Colorado Division of Homeland Security and Emergency Management (DHSEM) was exercising the division's Continuity of Operations Plan (COOP) due to building upgrades that rendered telephone and intranet systems inaccessible. The division's COOP provides an alternative State EOC location at the Colorado Department of Public Health and Environment's Department Operations Center (DOC). 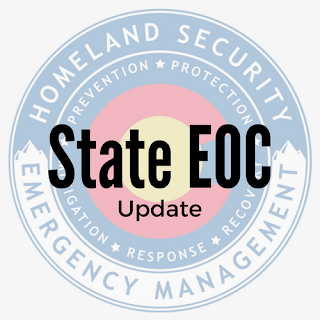 DHSEM initiated a seamless transition to the alternate State EOC location on May 18 as the snow storm impacted multiple counties across the state. This transition to an alternate site is evidence of the flexibility of state staff to respond and support emergencies in the State of Colorado anywhere and at any time. Operating at the backup EOC is an important part of exercising our COOP and is essential to ensure that we can react quickly and efficiently should something disrupt our normal operations. Personnel representing the areas of emergency management, road impacts, public works, resource mobilization, public health, utilities, public information, Colorado National Guard and the geographic information system (GIS) group were all present at the alternate EOC. They were supported by additional DHSEM staff working from remote locations. The success of using this alternate EOC location demonstrates that DHSEM is ready to provide assistance from multiple locations whenever a disaster does arise.